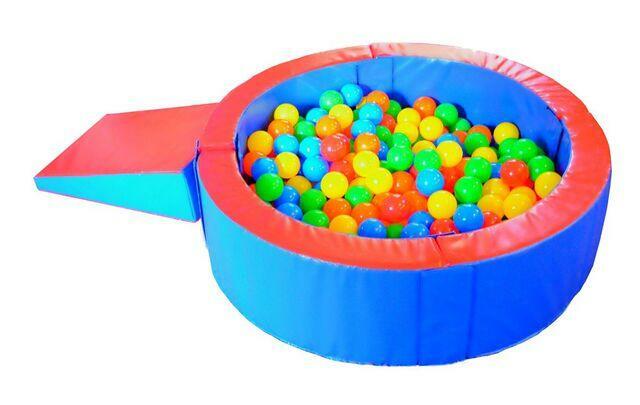 This little ball pool is perfect for your classroom, therapy center or home and provides hours of interactive play and valuable proprioceptive input. Inside diameter of 36” with walls that are 4" thick and 12” high that are connected with heavy duty 4” Velcro flaps. The pool also includes 36” diameter floor mat made from 1 3/8” thick cross-linked polyethylene foam and ramp for easy access. Vinyl cover is fire rated, mildew resistant, rot resistant, UV resistant and is free of lead and phthalates. All materials used in this product are CPSIA compliant and are made in the U.S.A. Balls sold separately. The ball pit is picture with 250 balls. Dimensions: H: 12" x 36" Dia.